A properly ventilated grow room not only eliminates odors, but also maintains a healthy growing environment. You might enjoy the scent of your garden, but don't want others smelling it, and that is where carbon filters come in. How do you ventilate a grow room? The ventilation system is responsible for maintaining optimal levels of temperature, moisture, and CO2. 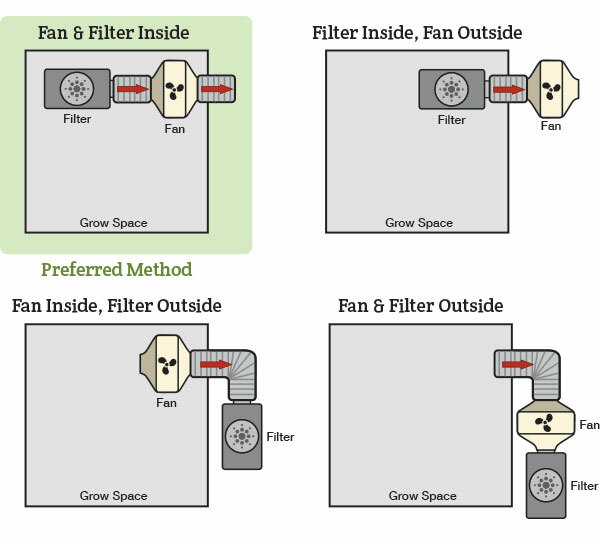 Depending on the size of your garden, this can be as simple as operating intake and exhaust fans, in conjunction with recirculating fans. In a more serious or commercial grow room, the ventilation system will consist of air conditioners, dehumidifiers, and CO2 producers. What does a carbon filter do in a grow room? The activated carbon inside the filter acts as a sponge, and will trap all particles other than air. This eliminates the odor, emissions, and even pathogens! Carbon filters will eventually need to be replaced, and we recommend getting one larger than you anticipate needing. This ensures your carbon filter is able to manage the size of your garden. Here at Hydrobuilder, we carry carbon filter and fan exhaust kits along with HEPA filter and fan intake kits. These kits also include ducting to fully seal your ventilation system, and a controller to automate your system. Buying a full kit makes setting up a ventilation system very simple! Sizing an intake and exhaust kit for your grow room or tent is simple here at Hydrobuilder. First, you must measure the cubic feet of your growing space (length x width x height). For example, if you are growing in a tent that is 3' x 3' x 5', your cubic space will be 45 feet. You can shop for a kit according to how large you space is, such as 32-200 cubic feet for smaller spaces, and 801-1600 cubic feet for large greenhouses or commercial warehouses. For more information on creating an environment that will lead to the highest yields possible, check out the articles in our learning center. If you still have questions, give one of our experienced growers a call today at 888-815-9763 and let us help you with the process!